One of our true pleasures is walking or hiking with each other. The pace allows for companionable silence or conversation, and for experiencing our current surroundings while letting the past and future fade. When we travel we look for opportunities to hike, and at home we walk the neighborhood or make small outings to local trails. Serendipity often blesses us while we’re out. When visiting Washington state last month, we intended a hike in Point Defiance Park, a city park in Tacoma. It hugs the shoreline of the Tacoma Narrows and Commencement Bay, south of Seattle. Jim also wanted to visit the park’s rose garden, displaying the last of early fall’s blooms. What we didn’t anticipate was the dahlia garden. The tall-stemmed blooms overwhelmed us with their joyful colors. We don’t see many dahlias where we live, so we lingered for a while, taking dozens of photos. Here are a few. Click to embiggen. This week we hiked closer to home. We drove to hiking and mountain biking trails a few miles away, next to the Coralville Reservoir. 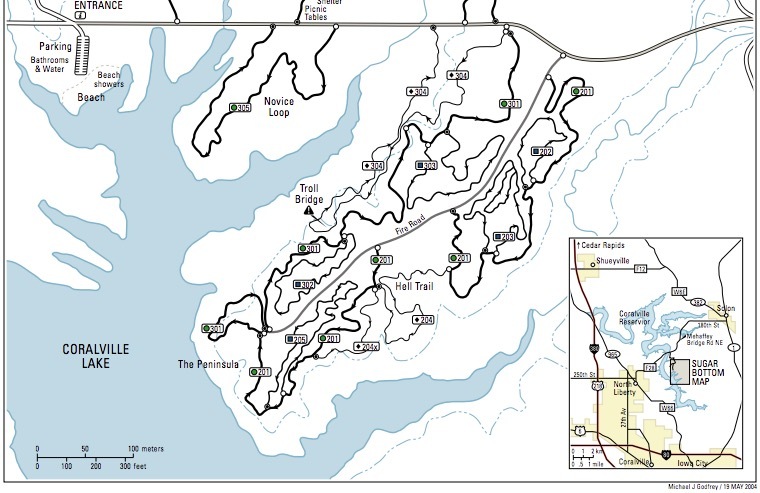 There are several miles of trails, rated from easy to difficult. Because they are for bike riders as well as walkers, the trails are designated for one-way traffic to improve safety. We hadn’t hiked in this area before and enjoyed the new adventure. Most of the trail is within the trees with no view of the water, though you can see the reservoir in places. 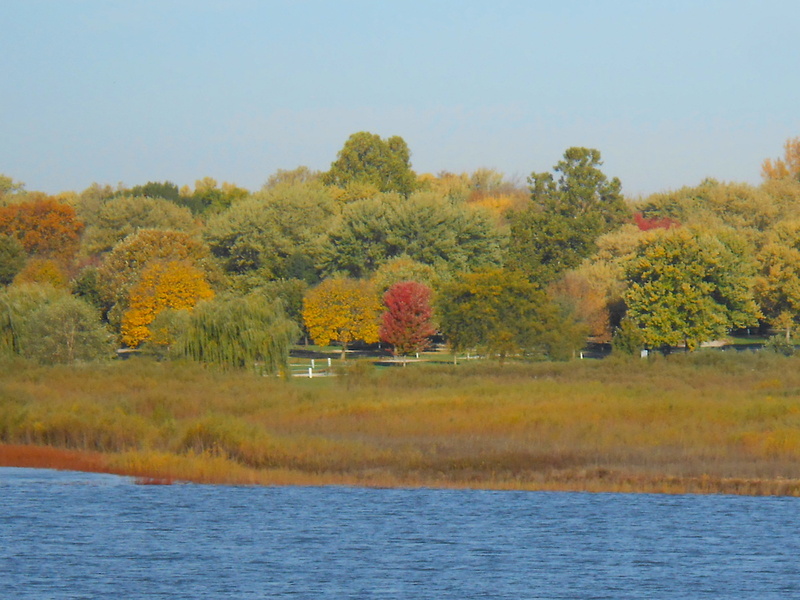 The fall colors are slow in coming this year, and the trees are still leaf-covered, perhaps due to our mild summer. 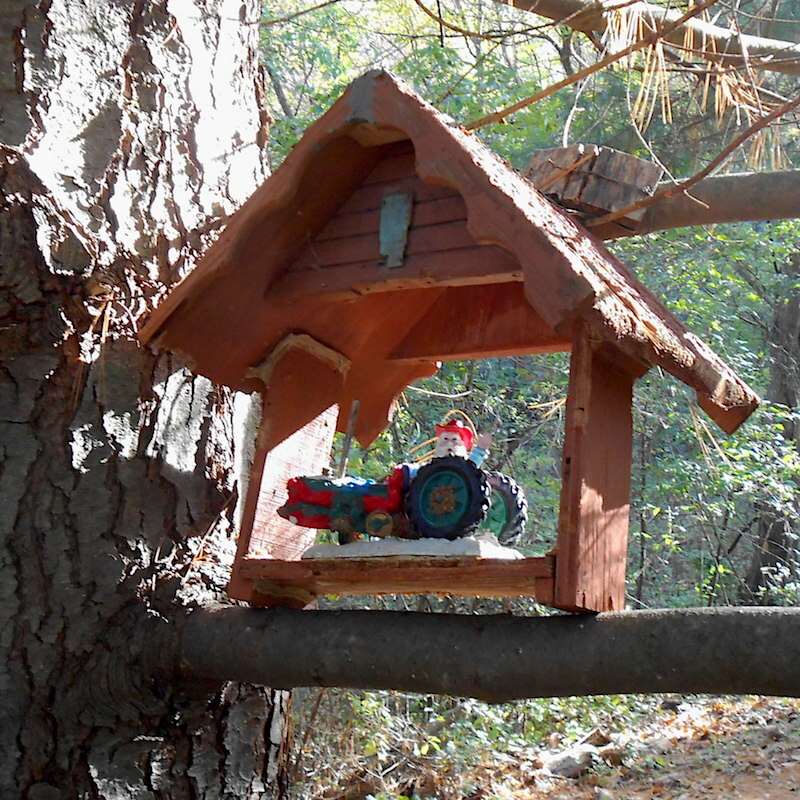 Our moment of serendipity came about halfway through our hike, when we chanced upon this Santa-on-a-tractor-in-a-creche. It seemed to be the perfect representation of Christmas in Iowa, though a little early. Since we hadn’t been to these trails before, we stuck to one designated as “easy.” There is a lot more to explore for other times. We’ll go back. This entry was posted in Hiking, Nature, Outdoors and tagged Dahlias, Fall colors, Hiking, Point Defiance Park, Santa on a tractor on October 20, 2017 by Melanie McNeil. I would have loved to see the dahlia garden. Washington and Oregon grow a lot of our ornamental plants. One day I would love to see their tulip fields. The dahlia garden was such a pleasant surprise. I need to try growing some next year. Sounds like a great festival. This is my second year growing dahlias and I’m hooked. If you don’t have a lot of space, you might try the smaller varieties that grow 2′ or less. Most of the large ones require 3 sf per tuber! It is a great festival. I grew up 30 miles from Pella, and our high school band marched in their parade every year — wearing wooden shoes. I still order certain treats from one of their bakeries every year at Christmas time. Actually, only on top. A little piece of foam took care of that! I’m really not sure if I’ve ever seen dahlias. They are beautiful plants, and they remind me of zinnias, which I do know. I enjoyed seeing the Coralville reservoir, too. We never spent a lot of time there, and I’m sure it’s been developed for recreation far more adequately than it was in the past. It’s great that it has those good trails, and it’s always nice to see some autumn color. I’m hoping to get away for at least a few days near the end of the month — but the end of the month is getting here faster than I realized: so maybe yes, maybe no.